My second build. Sub 900! Love it. This was my first time using a FD case, and I will definitely buy from them again. Even for mATX, there are tons of cable management options. The build quality is great for $30, though I had one problem. The side panel bends very easily, and is hard to take off. Other than that, it was actually the best case I've worked in, and I have worked in a Air 540. It is a very hard case to work in, and no cable management room but it gets the job done. Decent case. Side panel is kind of flimsy. Cable management could be better. from completed build Surprise, It's an AMD! Fun to work in. I definitely prefer this case over the last micro ATX case I worked in. For the price it's hard to complain, but there are a few things that would've been nice if they had been done differently. The front fan is mounted via clips. While it's not a huge deal, I find it odd and would rather it be screw mounted. On that note, there are no fan screws included with the hardware. Luckily I had some extra lying around. There is no opening behind where the motherboard sits, so keep that in mind when installing the backplate to your CPU cooler. Do that before securing your motherboard in the case! Cable management was surprisingly good in this case. There is a removable tray in the lower 5.25" bay that will open up cable routing options, provided that you are leaving the HDD/SSD mount in place. I found the mounting option to be strange, but it works and it's convenient for hiding the cables. from completed build First Build! $450 Budget Gaming PC! Okay case. I wouldnt really recommend it for gaming, as it doesn't have the best cooling options. Cheap and does its job, but has its flaws. Not really any cable management options other than shoving everything into the optical drive bay. Limited airflow options- only 1x120mm option for intake and only 92mm for exhaust. Side fan mount may be restricted by other components such as the GPU. I feel that Fractal design could have offered the option of another 120mm in the front for intake, as there seems to be enough room. I would prefer a bottom mounted PSU. 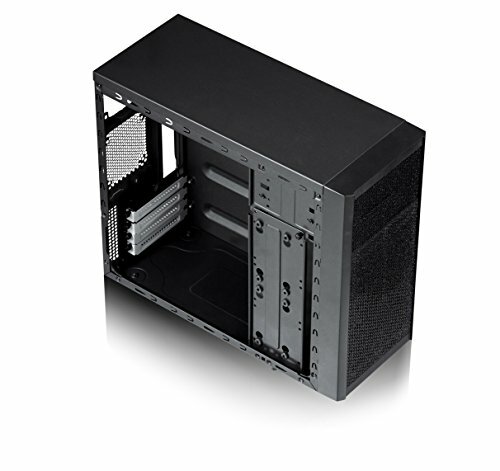 Pros: For the money, this case is really nice. Front filtered fascia with large fan from factory. Painted black inside and out. Rubber feet. Thumbscrews. Cons: Flimsy metal panels. Challenging to do proper cable management. It's compact and looks great. There is a problem with the clips that hold the fan in the front. It just doesn't hold the fan perfectly and feels cheaply made as sort of an afterthought. The power LED is very bright! Otherwise, it's a good case.